So, I set out for a lake adventure on this sunny Spring day in Italy – getting an “open ticket” on the ferry, allowing me to stop in one of six towns on Lake Como, including Bellagio. I realize once I am on the boat that wherever I start – I would have about a two-hour wait until the next ferry departure because it was lunchtime. That’s okay – I am going to need something to eat anyway. I make my first visit at Lenno – walk along the waterfront. See a few tourist places – and head up the hill to find the center (il centro) of the tiny little town. And a restaurant not for tourists – which, of course, I don’t regard myself as — but a place to eat for the townsfolk. I stop at a post office and buy some stamps (francobolli) for my postcards (cartoline). I ask the dude behind the counter – in Italian (of course: hey, I’m no stinkin’ tourist!!!) (which is ridiculous because I am. But I digress). Where can I find a restaurant, I inquire. Oh, we have hundreds of restaurants, tanti (many). 10 kilometri. I know enough to know I am not walking 10 kilometers to find a non-tourist restaurant. Pizza would be fine. At this point. Tic toc – lunchtime is almost over. My ferry departure is closer. AND I needed a toilette! I return to the restaurant I’d rejected. Order a nice salad and a glass of vino bianco and ask the waitress. Scusi. Dov’è il centro? Oh madame, she answers: here! This is il centro!! Lunch was perfect, by the way. It comes to the table – steam, redolent of garlic, warmly wafting from the plate. A mosaic of buckwheat pasta, melted cheese and green vegetables. Where to start? With a bite of potato? Or some kind of perfectly cooked green vegetable: the leaf of a romanesco cauliflower, a slice of – I don’t know – perhaps fennel. Subtle little greens – maybe broccoli – maybe spring vegetables. And that pasta! Humor me as I wax poetic over this pasto di pasta. A thick, not wide, noodle – with that hearty bite of buckwheat, delicately covered with sauce. It may triumph over Cacio e Pepe. Maybe. I haven’t spent any real time in Roma, yet. My very first pizzocchere. Accent on the second syllable: pea-ZOCK-uhree. 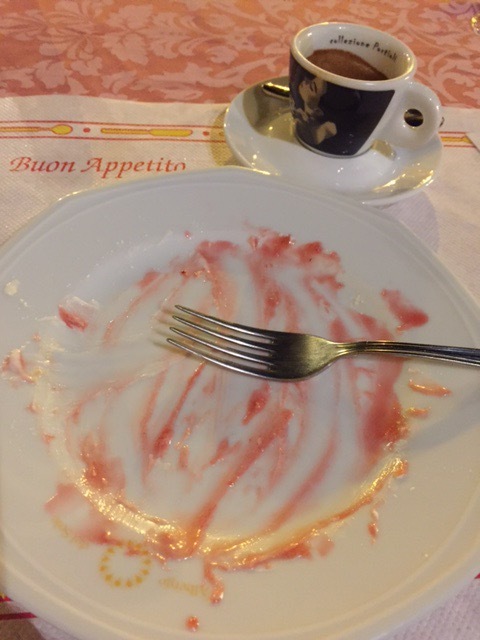 Oh – did I mention dessert: la meringa con fragole? Soft and crunchy. Meringue. With strawberry sauce and a kinda squishy, gelato-like layer. Janet Eats, indeed. Better head out for una passeggiata up and down those steep and narrow hilly streets called contrada. 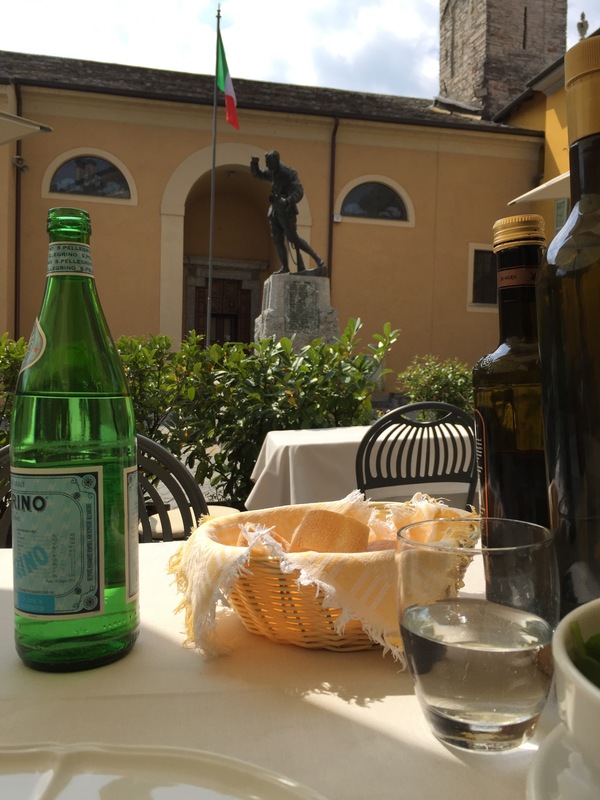 October, 2015: my annual voyage to Italy. I visited my cugini in Bologna. I really love to spend time with cugina (Italo-Americano) Paul, his beautiful Italian wife Laura, and one of their daughters: the adorable Michelle. The other daughter, Alessandra, is in California right now – attending high school in the Bay Area. 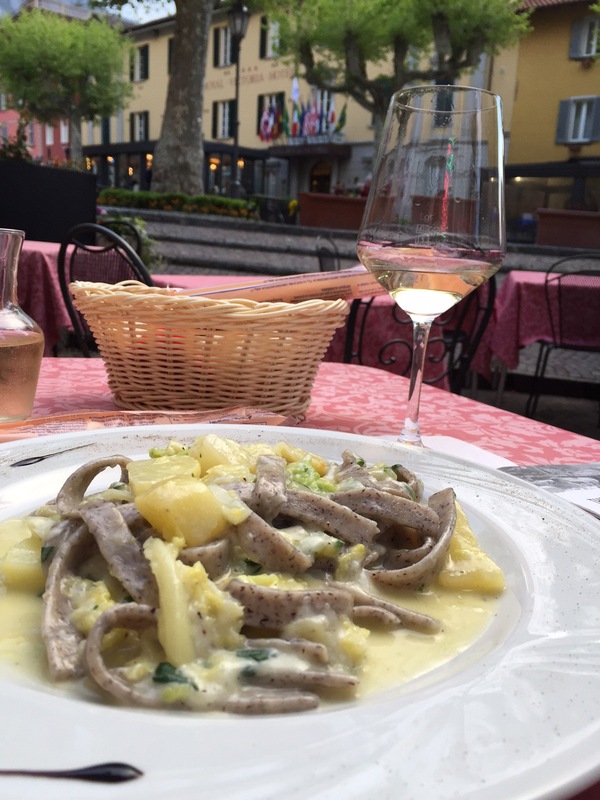 Bologna is, as I mentioned in a prior post, in the Emilia-Romagna region of Italy. Pretty much when you think of Italian food, you are really thinking of food from this region: prosciutto, lasagna, tortellini, ragu, etc. Garganelli – a quill-shaped egg pasta served in brodo or with ragu. Maybe I have seen this pasta shape before, but I don’t remember. 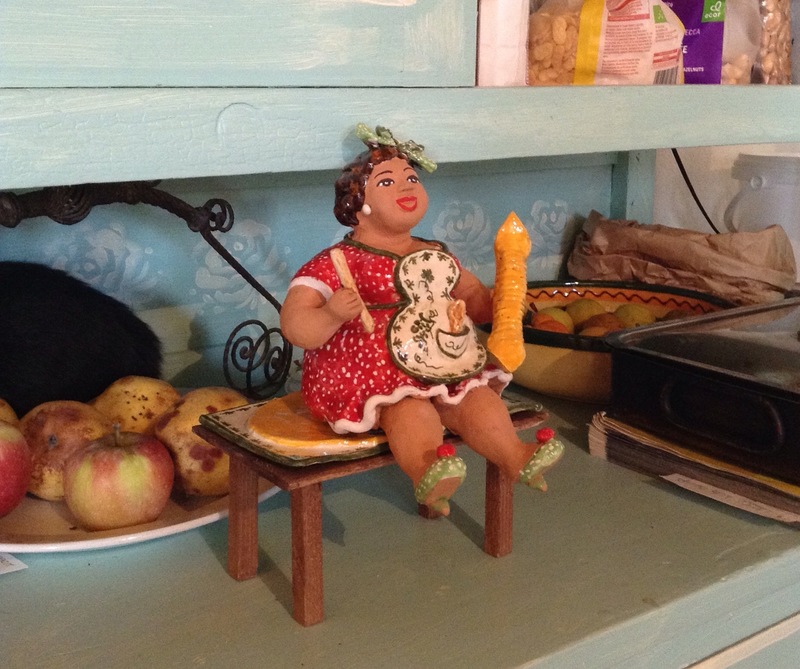 It is the pasta being held in the left hand of my new “friend” from Bagnocavallo: Signora Maria. You can read all about my adventures with Sig. Maria on my sister blog, rulingwoman.com. In short, I learned to make this pasta and fully intend to do so when I return to America. 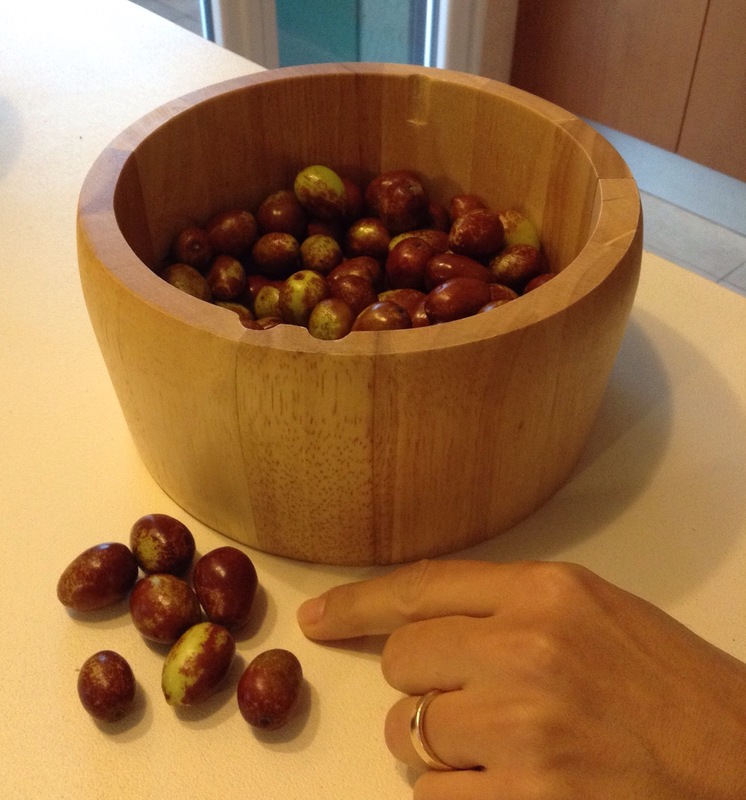 Giuggiole (JEW-joh-lay) is this fruit that grows on trees around Bologna. Passatelli in brodo. Very VERY regional. 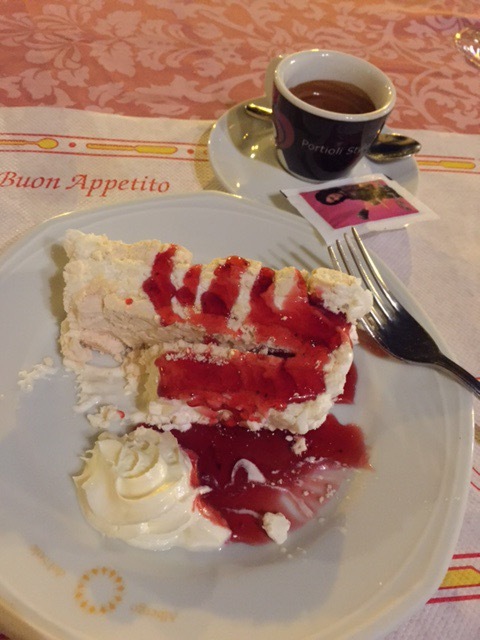 My cugini and I went to a restaurant on my last night in Bologna. When the waitress spieled off the dishes for the night, she mentioned Passatelli. My cugina, Laura, was delighted when she heard that, and immediately ordered it. “What is it,” I entreated. It is a “pasta” made out of Parmesan, breadcrumbs, eggs, lemon and nutmeg that is pushed through a press with holes (extruded almost like spaetzle though not quite). Passare – passed through. Dropped into a rich, steaming-hot broth. The waitress ladled this brothy, cheesy, doughy bit of wonderfulness into our bowls. Yep, I slurped it right up, I’m sure of it! Luckily, I didn’t have my phone with me, so nothing could stop me from diving right into this sensuous repast. In the midst of a vacation filled with (albeit delicious) street and restaurant meals, it is a delight here in Italia to have a good ol’ home-cooked dinner. Dinner with the the cugini in Bologna. With typical Emilia-Romagna foods. At the bottom – un “panino” of prosciutto and mortadella on a handmade tigella. The tigella (seen in the basket) is yeasty dough placed in a tigelliera — a cooking vessel with two plates of six circles each. You heat like a grill. Put a circle of dough in each circle – and press together. Cook, then flip. Then toss into a basket. Kind of pita meets crumpet. Split then fill. Funny, isn’t it, how every ethnic group has some kind of filled bread food. Pita. Taco. Dumpling. 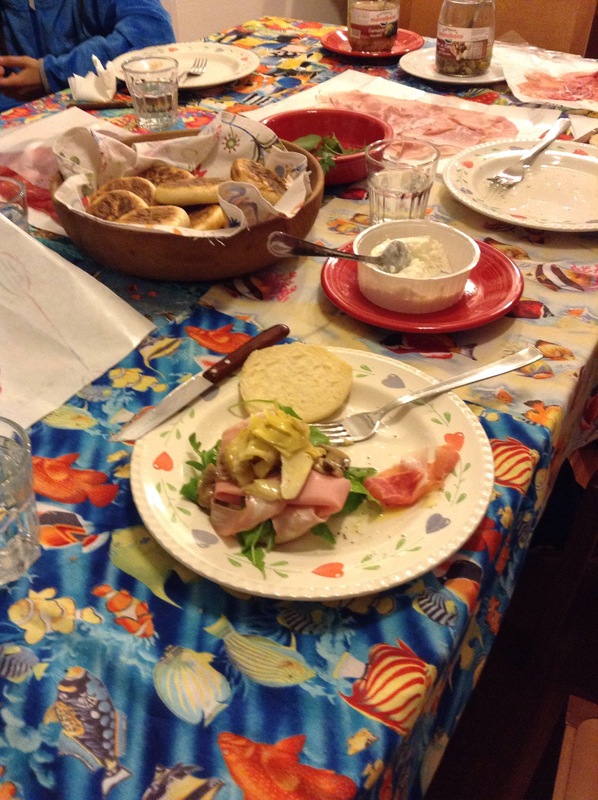 On the table: carciofi, prosciutto cotto, squacquerone, funghi rustici, salumi culatello, rucola.